Fuel efficient cars and alternative forms of transport come in all shapes and sizes. Are we ready for the Smart Car or the Aptera? The unrelenting increases in gas prices in the United States have started to significantly affect the way we conduct ourselves. It’s just one of the reasons why I’m rejoicing about my decision to toss my commute and quitting my job for the time being. A lot of people have the same idea, which unfortunately results in a lot of flux in our community of late. People are opting to work more closely to where they live, thus effecting changes in our neighborhood: my kids have lost some long-time teachers to the gas hikes, while we’ve had service workers in our area decide that their jobs were no longer worth the cost of travel. So what can we do about this besides cut back on travel? Well how about changing how we travel? 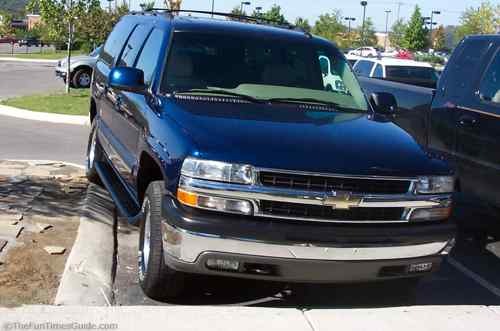 Just for fun, I’ve investigated a few options to our beloved gas guzzling S.U.V.s and family vans that may just be what you’ll see down the road en masse in the years to come. According to the New York Times, 20% of vehicles sold last April was a smaller model (compact or subcompact). Contrast that to 10 years ago, when trucks and S.U.V.’s were the rage — back then, one in eight vehicles sold was a compact. When you’ve taken the steps to reduce your need for fuel and you’re no longer dependent on a costly resource, it can only be described as liberating. Let’s take a quick look at other possibilities that can help us (almost) forget about high fuel costs forever. #1 A Cute Hybrid. 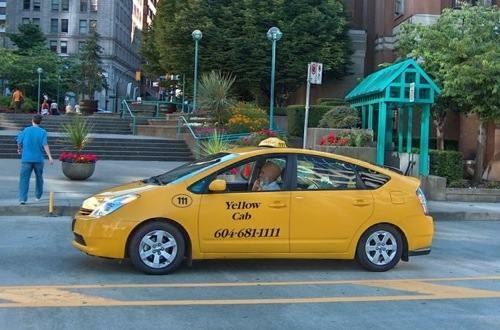 It’ll be the day when we see these Prius taxis everywhere. 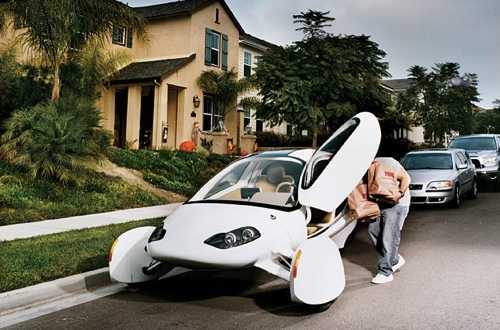 #2 Weird New Electric Cars like this Aptera. More and more electric cars are hitting the market, though many are still in the prototype stage. Some dealers are now taking reservations and have long waiting lists despite some of their more obscene prices (e.g. Tesla). For the record, the Aptera, a diesel-electric hybrid, gets 250 miles to the gallon. #3 Go smaller with Micro-Compact Cars. Everyone knows compacts are great for gas conservation, so why not go for micro-compact cars? If you’re keeping a conventional, standard-sized model for family use, you can still opt to own one of these tiny cars for commuting purposes. The only issue I have with them is that you’re pretty much toast if you get into a mishap with a larger vehicle (well, just like you would be if you were riding a motorbike)! Europe is big on Smart Cars, will the U.S. follow suit? The Corbin Sparrow seems like a step up from the diminutive golf cart. #4 You can always stick to the traditional two wheelers, like the Self-Powered, Manual Bicycle, especially for shorter trips. #5 How about this Motorized Scooter called the Segway? They’re just the ticket if you’d rather not make your legs do the walking! Some shortcomings of this high tech scooter: the price tag is $5,000, they go no faster than 12.5 miles an hour and need to be charged every 25 miles. They offer no protection from the elements (same issues as a bike or a motorbike) and are most practical if your commute is fairly short. But you’ll never have to fill up with gas when you travel this way! 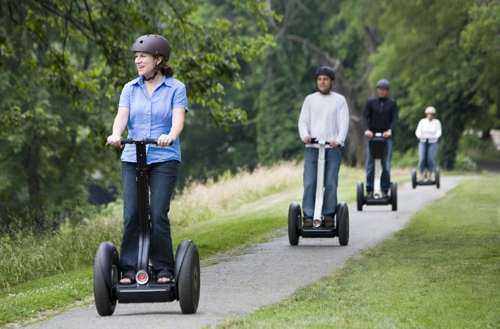 For a clever way to use the segway, take a look over here. 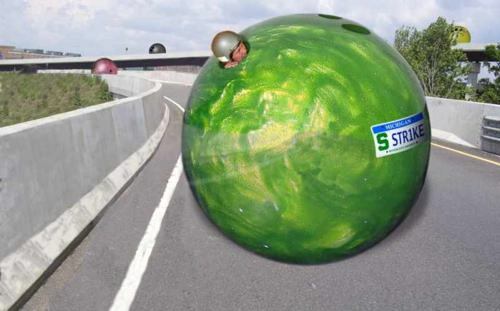 #6 A Traveling Bowling Ball. An alternative concept that’s outside of the box (or wheel) 😉 . Funny idea, too bad it’s not real (haha!). Out of all the forms of transport here, this is the only one that you’ll probably never see on the roads….at least, during your lifetime! Any other ideas about what we may be seeing on our freeways in a decade…. or when gas hits $10 a gallon? I am seriously hoping that some whiz kid genius is going to get all excited from watching Star Trek and make it his life’s ambition to create a teleporter. If that fails then I want a another slightly less whiz-like but more crazy-like kid to work out the kinks in Willy Wonka’s Wonkavision, making my sweet chocolate and traveling dreams a reality. Until then I will try to bike commute. I hope people will read this and sire more children to increase the chances of this happening. Smart cars may not be all that smart. The price is close to a Toyota Corolla and the run on premium. You are paying a little less to have much less room. Yes they are comfortable and sit pretty high compared to the Corolla but if aren’t single or a DINK. They just might not be the best bet. That being said if you have a 16 year old and want to by them a car you might as well get one so they can only have 1 friend in it. That’s just too funny! 😀 I wouldn’t mind going back to a time when we all rode horses (disclaimer: I love horses) but it would take forever to go anywhere, and there would be stuff to clean up off the roads all the time! lol. I’ll settle for teleporters too, I guess. But with the gas crunch, it seems that the trend is towards smaller and smaller cars. That’s where the money is going these days, to develop more compact vehicles. I find it hard to give up the bigger cars when you start getting used to it though! The Smart For-Two model is supposedly the most fuel efficient gasoline powered car for sale in the US, but the wikipedia has mentioned that its fuel efficiency is lower than some hybrids. I believe the Smart’s MPG ratings are 33 for the city and 41 for highway use. The positive here is that the Smart For-Two is cheaper than your typical hybrid. I wouldn’t use the tiny cars for anything other than commute purposes. When you drive to and from work by yourself (which I used to do all the time). 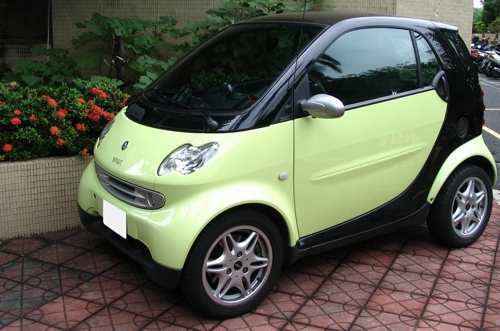 Count me out when it comes to trading in my safety for the shoebox Smart car. Maybe around the city it makes sense but on the open road? No way! You got $5,000? If so, let’s go test drive a Tesla. 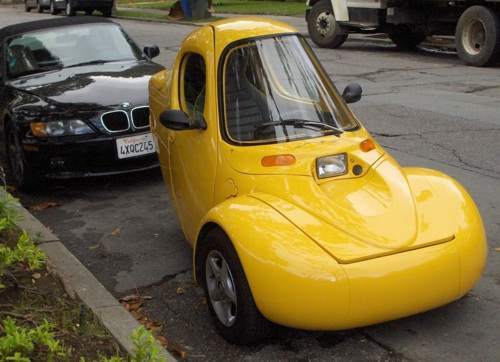 Yeah the Corbin Sparrow looks like a giant banana on wheels. 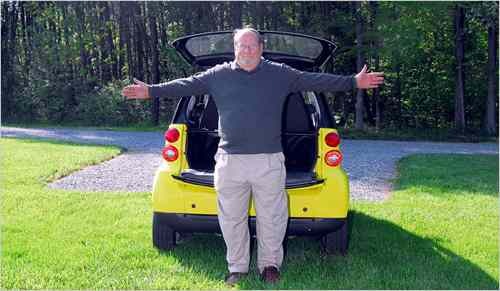 I have a friend who has a Smart Car, it gets about 40 mpg and is very small. It has a lot of room inside (he is 6’4″ and still comfortable) But its priced comparable to my Mazda3 (I paid 13500), which gets 35-39 mpg–the closer to the speed limit I stay, the higher mpg I get. All things considered, I will stick with the Mazda. If I had a choice, I’d pick the bowling ball :). As for the Smart, many people assume that they don’t offer much crash protection because of their small size, but they actually do surprisingly well in crash tests. My biggest beef with the Smart is that the fuel economy isn’t THAT much better than a lot of other small cars like the Honda Fit or Toyota Yaris. Given that a Smart is almost as expensive, I’d prefer the option of a back seat and more room. In the future, I expect we’re going to see a much greater emphasis on hybrids (including diesel-electric hybrids and plug-in hybrids) and fully electric cars (like the Zenn). Or maybe giant bowling balls. They just started selling the Smart in St. Louis and at a nearby lot the sticker prices are over $30k. I’m sorry, but that’s just ridiculous. For about the same MPG I can get a used Corolla or Mazda3 for about 1/3 of the cost. Not to mention I can actually fit my son and his carseat in the Corolla or Mazda. As has been reported, what you all say here seems to strengthen the impression that the Smart car doesn’t have too many fans and it’s been discontinued several times in the past. It is a car designed primarily for the city, so unless you’re a city slicker, this may not be a practical choice. Other pluses? It’s “cute” and turns heads. Still, they do offer some level of fuel efficiency in absolute terms, but relative to other compact car options, they may not be a first choice. But I wish I could see this thing for myself. It’s gotten mixed reviews. I believe Daimler is working on new models and hybrid versions of this car, so we’ll see! In the meantime, if you’ve got a personal relationship with this car, let us know! I wouldn’t say that I’ve got a “personal relationship” with the Smart (more of a casual aquaintance), but I have driven one quite a bit (2006 Canadian diesel model). It’s a nice little car, actually fun to drive in the city, okay on the highway, and gets tons of attention. I just don’t think it offers the best bang-for-the-buck. I LOVE the Aptera and Smart Car. I cannot wait until those are more available. I was in Europe last month and they have so many adorable compact cars and scooters — we are so slow in adapting! While I hate that gas has become so expensive so quickly, I think this really was the wake-up call we needed. I think it is important to start moving towards more efficient cars, but am not sold on the Smart Car. I know someone who drives one and he does get about 35% better gas mileage than I do, which would save me $200 – $500 a year in gas. This gas saving, which is rather minimal is at the expense of personal space and safety. I wouldn’t want to get hit by one of the many large vehicles that are prevalent on American roads while driving a smart car. For me, it would take many years to see a monetary benefit from trading my existing car in and getting a smart car. When you take into account the space issue and how small it is, I do not see it as a good choice. How on earth do you manage to unearth the coolest images. Anyway, we have converted our car to NGV and, man, it’s cheap. I like that Aptera, it looks very futuristic. With it being diesel, you could also make use of bio-diesel and save yourself more money that way. Personally, I’m loving the Tesla roadster. All electric, and quite nice to look at. I like the Smart Car.. How much is it? Agree with Michele. The barely-better mileage on some of the pricey mini cars is surprising. Although even in Missouri, you’re see a change. Not long ago, you’d see a handful of Hummers for every Prius. Now it might be fully the opposite. I’m interested in electric and the idea of upgrading efficiency at the plant level. Seems like a lot of things can go wrong if we try and push every exotic technology to the car level. I personally want a Tesla roadster, however until my finaces get REALLY FIXED that’s not going to happen *grin*… I’m going to have to check out the aptera! I have to agree with Ameriglide. I’d be terrified to drive around Austin with all the “Soccer moms” in giant Tahoes/Excursions/name your giant vehicle of choice talking on their cell phones, drinking coffee, putting on makeup, and driving in their spare time. I wonder if the auto industry has done any crash tests with those little bitty cars. I can’t imagine that they’d be very safe in an accident with a large vehicle. These photos are great!!! 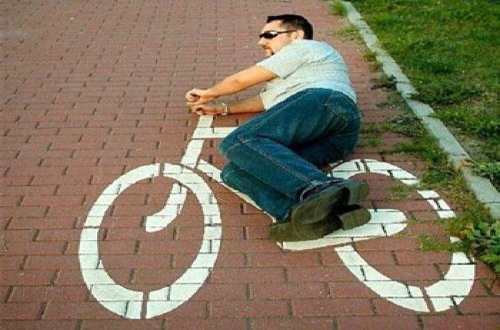 I especially love the frugalist on the free bicycle…. LOL! The cute little cars look soooo neat and fun and thrifty. I’ll be getting one as soon as all the other road cowboys give up their lumbering beasts. Till then, I want some serious metal between me and the wackos on the freeway! I’m glad you enjoyed them! 🙂 Let’s all just have a good laugh over these crazy gas prices. Better that than crying over spilt gas…. hoho! Really awesome Motorized Scooter (Segway). Using electricity is great, but it can make something less reliable to use. Nice pictures. That futuristic car is really awesome. Many of those smart cars are very strange looking. Sure they may be good on gas, but they are just bizarre looking, plus I think it won’t be very safe against a big car. Not all small cars are cheap. Also hybrid cars are still very expensive. I was few time driving Segway, it was really cool!!! About smart is nothing to tell, its old car, but 10 years ago it was also a good choice! Photo of Aptera is really COOL!